VitroGro® ECM is intended to be used in the management of chronic venous leg ulcers that do not follow the normal processes of wound repair and that have been present for more than 4 weeks despite conservative management. Chronic wounds have a dysfunctional extracellular matrix that hinders ingress of repair cells such as keratinocytes and fibroblasts. VitroGro® ECM is intended to act as a replacement for the dysfunctional extracellular matrix. 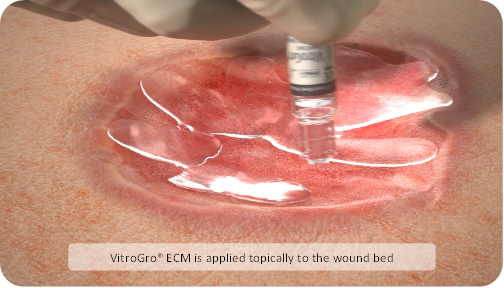 Thus, VitroGro® ECM is administered topically to the wound bed and permits cells to attach, migrate and proliferate so leading to tissue regeneration and ultimately to wound closure.